We all love a great kitchen that is both pretty and functional. But when your kitchen is quite small, organization and cupboard space can be a problem. These great space saving kitchen ideas make life so much easier in a small kitchen. 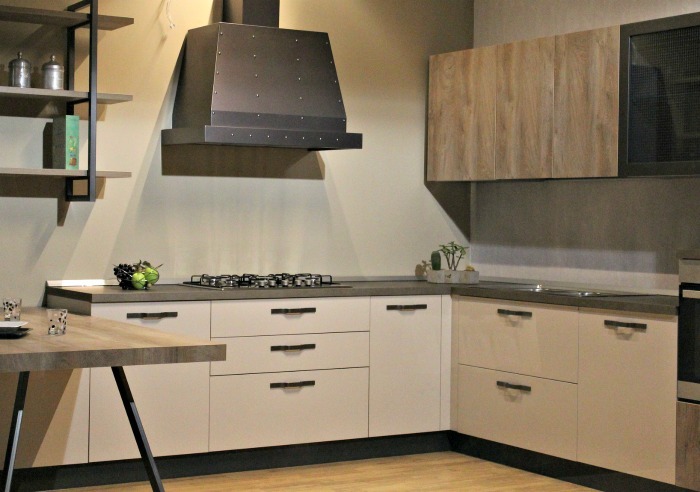 Whether it be storing appliances, cupboard organization ideas, or choosing the right kitchen gadgets and toys, these organization tips for small kitchens will make the most of your small kitchen space. When your kitchen space is small, every foot of space counts. The key to giving more room, for me, has been prioritizing what I need in the way of both space and usability. Sometimes one badly organized space can be turned into an idea that will hold twice as much or do double the duty. It’s just a matter of thinking outside the box. At the top of my space saving kitchen ideas is this pantry door. When you have only about 3 feet of walkway in a kitchen space, pantry doors are a no no. We solved that problem in our galley kitchen recently by adding a sliding shiplap barn door as a space saver. Now, instead of a pantry door opening up into the kitchen walk way, it slides along a metal rail. This lets two people be in the kitchen at the same time without crowding each other out. 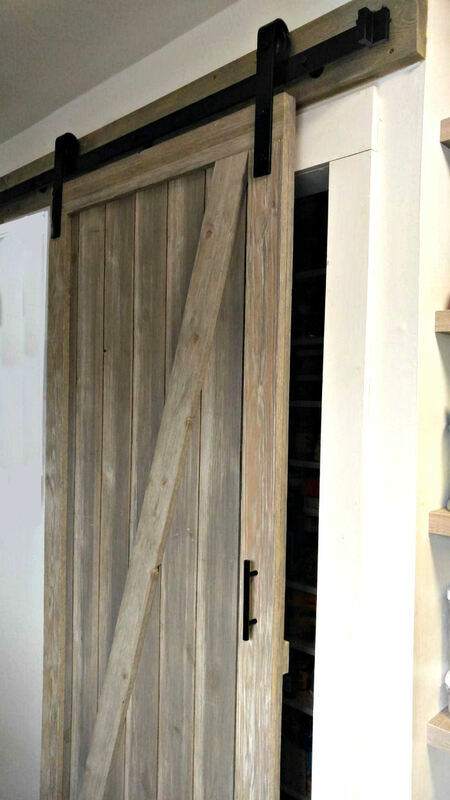 Check out the step by step tutorial for the sliding barn door project. i have a reasonable amount of lower cabinet space. 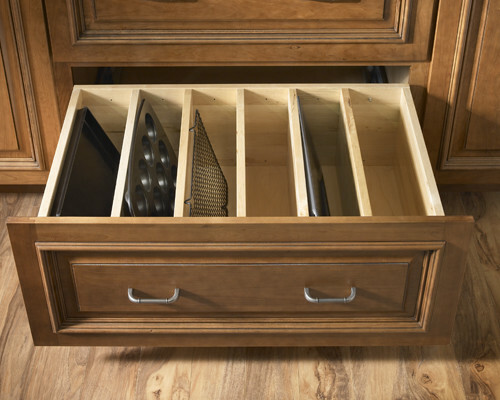 Converting a cupboard or two into this type of drawer set up would be a great way to store dry goods and still keep them in a dark spot that is still handy to use. It would be worth it to me to sacrifice a lower cabinet to get this kind of dry good storage. Image Source: Dering. 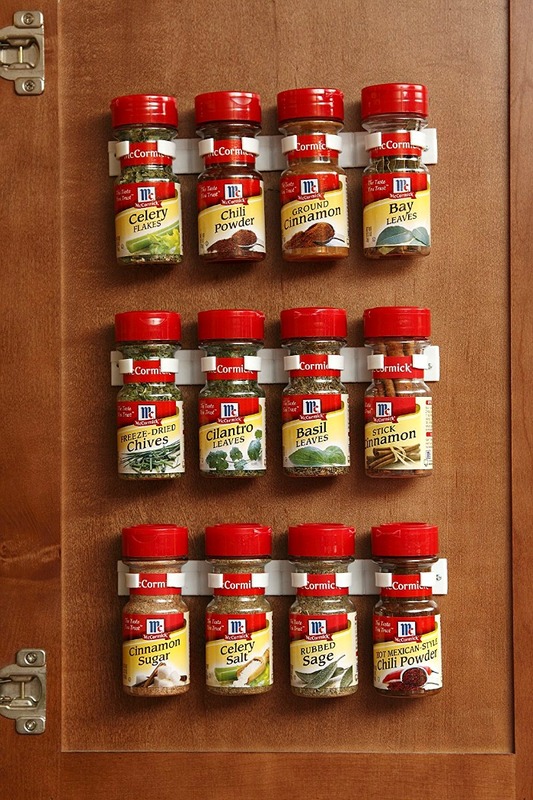 For this easy organization idea, gripper clip strips are used to store dried herb jars. These inexpensive strips are easy to install and can be custom fit to your cabinet space. You can find them on Amazon. My kitchen is a small galley kitchen. What little wall space I have is taken up with upper cupboards. But I love to bake and cook (what else for a food blogger?) so I need a very functional stove. 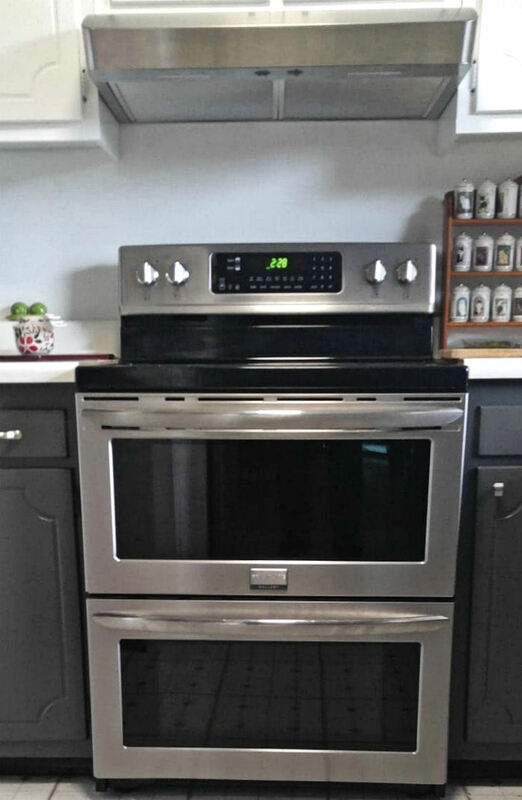 We just replaced our (very old) model with a new Frigidaire double oven convection electric stove. I sacrificed the bottom storage/warming drawer for an extra oven. The beauty of this stove is that each oven cooks independently. Not only can they each have a different oven temperature, but one can be normal and one convection. I got my double oven without having to give up valuable cabinet space for a wall mounted oven, and got so many extras in the way of functionality, as well. When I am not using the bottom oven, I store my pans in there so it takes the same amount of space as my old stove did. My kitchen aid mixer is one appliance that I have left out on my decluttered counters, but for another idea, this Rev a Shelf lift stores the appliance in an unused cupboard under the counter until needed. See in in action in this video. With this lift, there is no need for you to lift out the heavy appliance when you need to use it for baked goods. It’s not inexpensive but it might be on my list of items to purchase when the our kitchen renovation is complete. And while you are at it, add a cutting board divider as well. This idea from Decora uses an organized drawer also has a stashed cutting board that is ready to use when you need it but takes up no extra counter space. Brilliant! We took out the phone and installed floating shelves. The space now holds my canisters (freeing up counter space), lots of Oxo containers to hold baking supplies, dry goods and some decorative items as well. For years, I had every appliance that I owned on my counters, thinking that they would be easier to get to when I needed to use them. And you know what? I always complained that I had no counter space on which to work. When we started our kitchen renovation project, I did two things. I stopped using the counters to store everything so that is handy and only kept out the items that I use all the time. You will be amazed how much more counter space you actually have, even in a tiny kitchen, if you stop using it for storage. The kitchen above is even smaller than mine but look at the usable space. (I’ll show you mine soon, when I get my new counter tops.) But a hint…it now holds only a Kitchen aid mixer, some often used kitchen tools and a coffee pot. My crock pot, can opener, cutting boards, trivets, cake tray and dozens of other items go where they belong…in drawers and cupboards until I need them. You will be amazed how much more space you have to use if you just de-clutter the counter tops! 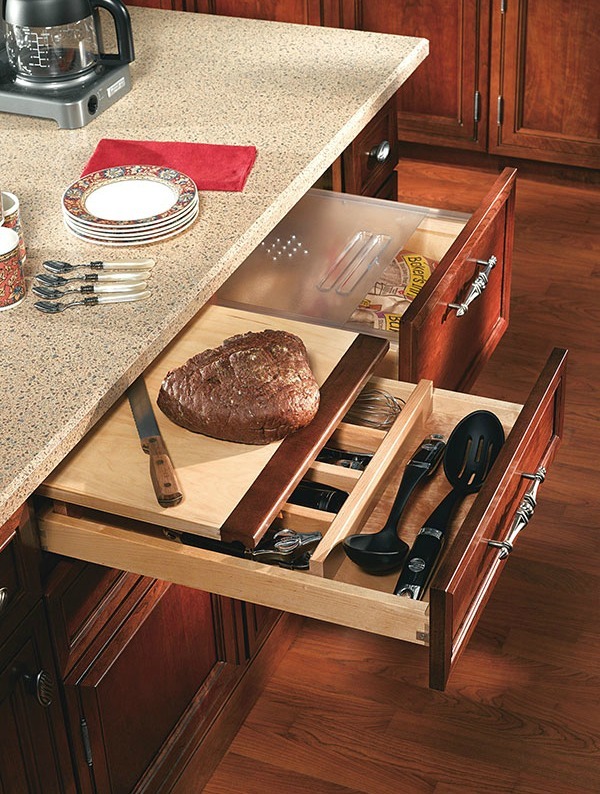 What a wonderful idea this baking sheet drawer is! I know that every time I bake, I have to take out the whole stack of baking pans to get the one I need. With a drawer like this, and those dividers, the trays are ready for you to choose. They hold as many (if not more) pans in the same amount of space, but you can actually see what they are and don’t have to remove them all to get to one! Just genius! This is organization done right. Image shared from Houzz. 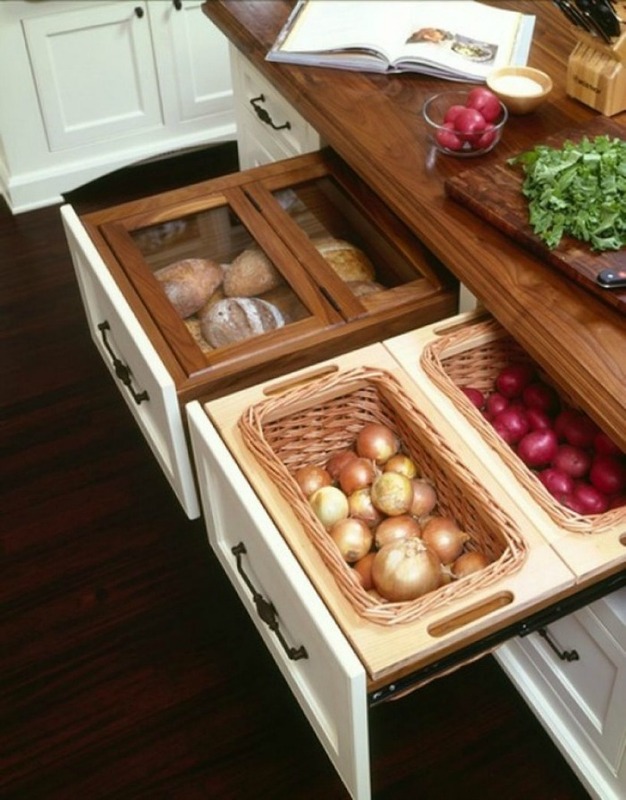 This is another of my favorite space saving kitchen ideas. 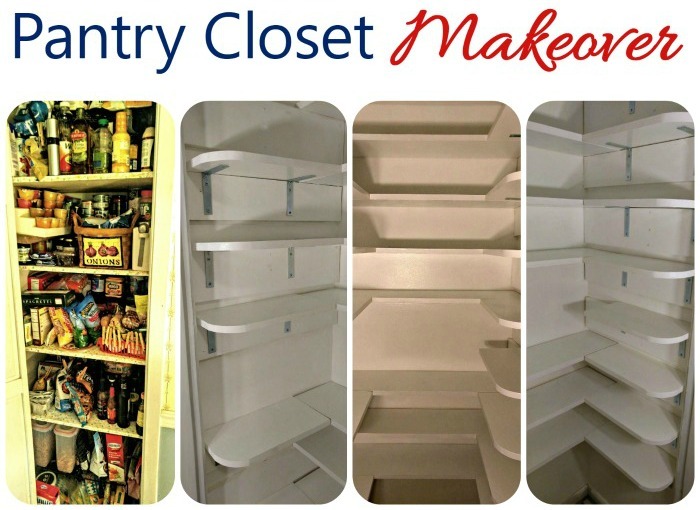 Prior to a make over, one tiny closet was crammed full of every kind of kitchen supply possible. This made it impossible for me to find anything in my kitchen when I needed it. My industrious husband gave my pantry a make over and turned it into a small walk in style pantry. There is just enough room for me to get in there and see what I need, and (believe it or not,) it holds the same amount of stuff! See the whole pantry make over tutorial here. The inside of cupboard doors can be used in lots of ways to store items that might otherwise sit on a counter top. For me that was a collection of cutting boards and wire racks. My husband put together a handy holder for one for me using some recycled wood. The project cost less than $5 for hardware. It now holds a couple of wire racks, and three cutting boards of different sizes. They are still handy when I need them but not taking up valuable counter space. See the the cutting board holder project here. 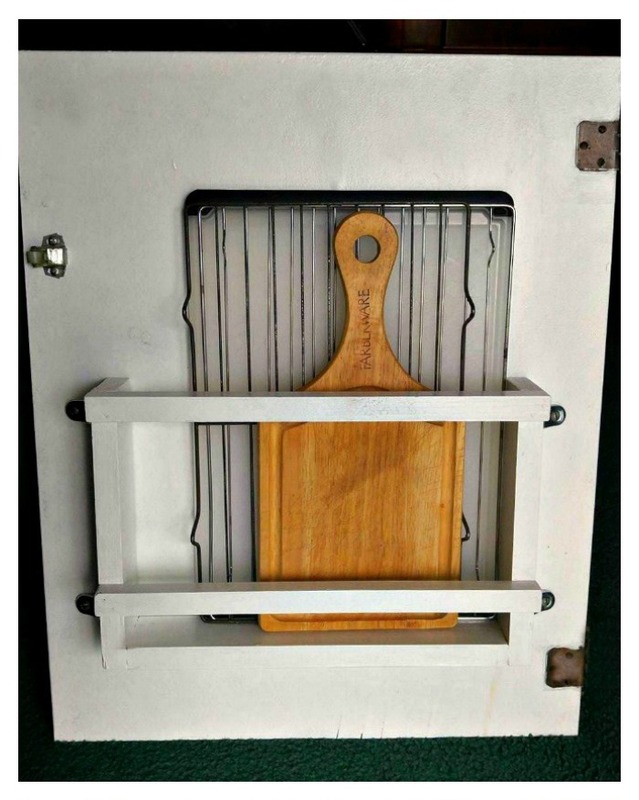 Finishing up my list of space saving kitchen ideas is this cabinet organization tip. Often times, a kitchen cabinet becomes a catchall space for odds and ends. 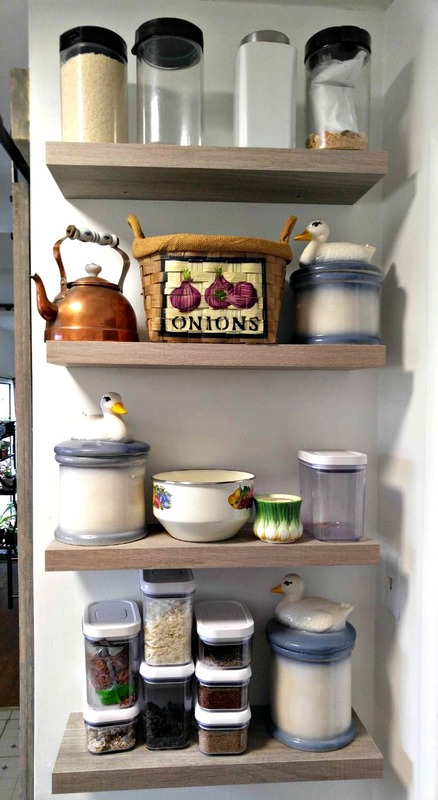 For this kitchen organization idea from Tidy Mom, a disorganized kitchen cupboard got turned into a really usable space for decorating items. 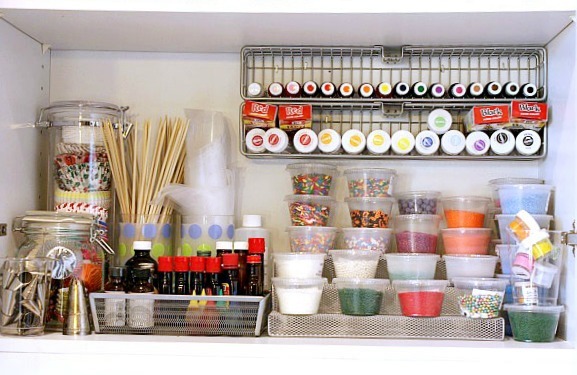 Instead of one cupboard crammed full of sprinkles, extracts, bamboo skewers and the like, she can now easily find just the right item to decorate when she makes baked goods. I LOVE the wire rack attached to the back wall of the cabinet to hold the gel food dyes. It is the perfect use of a space that often goes unused in a cabinet. What space saving kitchen ideas do you use in your small kitchen? I’d love to hear your organization tips in the comments below. Editorial Note. This post was originally published in 2013. I have revamped it and updated it to show more space saving kitchen ideas as well as photos of my ongoing kitchen renovation project.